We searched 10 superlative terms in conjunction with “cancer drug” in Google’s news search (http://news.google.com) between June 21, 2015, and June 25, 2015. Superlative terms included “breakthrough,” “game changer,” “miracle,” “cure,” “home run,” “revolutionary,” “transformative,” “life saver,” “groundbreaking,” and “marvel.” Terms were prespecified and identified through discussion. All articles resulted were read in full by one reviewer (M.V.A.). 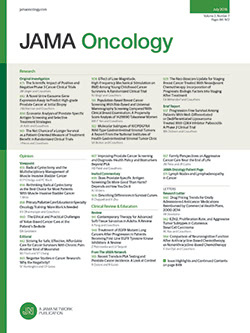 The following information was extracted: drug described, mechanism of action, class of medication, whether the agent described had already received US Food and Drug Administration approval, whether the data described concerned human trial results or preclinical (eg, mouse or cell culture) data, and the quoted individual (physician, journalist, industry expert, or patient). An academic hematologist-oncologist (V.P.) researched mechanism of action of all drugs and coded their class as cytotoxic, targeted, immunotherapy—checkpoint inhibitor, immunotherapy—therapeutic vaccine, radiotherapy, gene therapy, or other. We found 94 news articles from 66 distinct news outlets that made 97 superlative mentions that fit our criteria, referring to 36 specific drugs, with 3 articles not naming the drug. The most common class of drugs referenced was targeted therapy (17 of 36 [47%]). Nine (25%) cytotoxic drugs were discussed, followed by 5 (14%) immunotherapy checkpoint inhibitors, 3 (8%) cancer vaccines, 1 radiotherapy, and 1 gene therapy. Among 97 superlatives used, 39 (40%) referred to a targeted therapy, 37 (38%) referred to an immunologic checkpoint inhibitor, 10 (10%) referenced a cytotoxic drug, 5 (5%) discussed a therapeutic cancer vaccine, 3 (3%) did not name the drug, 2 (2%) referred to a radiotherapy, and 1 (1%) referred to gene therapy. Precisely half (18 of 36) of drugs described had not received Food and Drug Administration approval (as of July 15, 2015) for at least 1 indication. For 5 of 36 (14%) drugs, superlatives were used in the absence of clinical data (ie, based solely on mouse, cell culture, and/or preclinical work). The specific drug mentioned, superlative used, and other characteristics are described in the Table. A variety of speakers were credited with using the superlative (53 journalists [55%], 26 physicians [27%], 9 industry experts [9%], 8 patients [8%], and 1 member of US Congress [1%]). In the majority of cases (55%) the superlative was used by the author of the article without any other attribution. Our investigation finds that the use of superlatives to describe approved (50%) and nonapproved cancer drugs (50%) is common. Superlatives are used for all types of medications, including those, such as therapeutic cancer vaccines, which historically have low response rates4 and drugs that have not yet shown overall survival benefits (eg, palbociclib). Of concern, 14% of drugs were praised without any human data. Use of superlatives reflects the current “hot fields” of cancer research. Although immunologic checkpoint inhibitors made up only 14% of the unique drugs mentioned, they accounted for 38% of all superlatives. Targeted therapies were the most common drugs mentioned, and they received the most superlatives. One limitation to our work is that it was conducted 3 weeks after the 2015 American Society of Clinical Oncology conference; as such, it may not reflect the use of these terms at other times, as well as in other years. A range of speakers used superlatives, but the majority were journalists (55%), who may not have the expertise to identify the most promising medical therapies, or what magnitude of benefit warrants a superlative. The use of superlatives is common in cancer research news articles. Some of this use may be questioned. Corresponding Author: Vinay Prasad, MD, MPH, Division of Hematology and Medical Oncology, Knight Cancer Institute, Oregon Health and Science University, 3181 SW Sam Jackson Park Rd, Portland, OR 97239 (prasad@ohsu.edu). Published Online: October 29, 2015. doi:10.1001/jamaoncol.2015.3931. Author Contributions: Mr Abola had full access to all of the data in the study and takes responsibility for the integrity of the data and the accuracy of the data analysis. Critical revision of the manuscript for important intellectual content: Abola. Administrative, technical, or material support: Abola.